Contact With Extraterrestrials - how might it happen? Certain sections of the astronomical community are constantly searching for contact with extraterrestrials. The SETI program (Search for Extraterrestrial Intelligence) has been running since the mid 20th century. The fact that nothing has been found so far (with the possible exception of the "Wow Signal") is a little disheartening, but the quest continues. However fruitless the results to date, this page will examine by what method such an eventual contact might be made, plus its implications on society and the well-being of the human race. How Might Contact With Extraterrestrials Be Made? Given the age of the Universe and, more specifically, our Milky Way Galaxy - and assuming intelligent alien life can be found on other planets - it seems possible that there are many extraterrestrial races out there that are much more technologically advanced than us. If they are anything like us (but, don't forget, they might not be), they would be inquisitive and want to reach out and search for other alien intelligences that might exist. We have a paradox at this point, in that, if there are thousands, if not millions, of alien races out there, how come we've never experienced any evidence of them? This problem is discussed further down the page, but, for now, we'll just consider how intelligent aliens might go about seeking us out. Given the vast gulfs of space involved (the Milky Way Galaxy alone being 100,000 light years across), would contact with extraterrestrials, when it happened, consist of their turning up in spaceships...in person? This has certainly been the case in a number of blockbuster motion pictures - Independence Day, Close Encounters of the Third Kind, The War of the Worlds, The Day the Earth Stood Still, ET the Extraterrestrial and Signs, for example. Sometimes the aliens are depicted as benevolent, other times, aggressive. Could this actually happen, though? Any alien race would have to come from another solar system - it's pretty certain that there are no intelligent races elsewhere in our own Solar System. We'd have seen evidence of them. It is estimated that the nearest Earth-like planet (one that could possibly support an intelligent, technologically advanced life form) is about 12 light years away. Unless the aliens had perfected faster-than-light travel (utilising wormholes, for example) any epic voyage involving living beings would require immense dedication on their part. The next best thing to making a personal visit is to send an unmanned, robot probe. The advantage here is that the probe could use conventional propulsion, as opposed to a hypothesized "warp drive", or a huge starship where generations of aliens came and went over a voyage of many hundreds of years. If the probe were constructed using extremely advanced technology, it could easily survive an epic journey over interstellar distances, settle itself into orbit around a planet that showed promise and even put itself into hibernation until signs of intelligent life appeared on the planet it was monitoring. Scientist Robert Freitas, who is a researcher at the Institute for Molecular Manufacturing in California, has suggested that any alien race that can cross interstellar space, whether in person or using probes, must be at least a Type II civilization on the Kardashev Scale (more of that later). This means that they would be far more advanced than us and their probe may be able to impart such fundamental information to us as the solution to the Theory of Everything. He is of the mind that the aliens would also be ethically advanced and would take steps to avoid culture shock amongst the human race by releasing information very gradually. Freitas comments further that a probe would be far more efficient than a radio message, as those civilizations who chose not to respond to a radio signal, for whatever reason, could still be monitored by the probe, with information broadcast back to its senders. At first sight, an alien civilization sending out a radio transmission to show their presence may seem the easiest, most cost effective way of establishing contact with extraterrestrials. But, let's consider this scenario in more detail. For the best chances of detection, a signal would have to be continuous, directed at all points of the sky. A transmitter capable of this and strong enough to reach out sufficiently far into space would require a huge amount of power - in fact, a large fraction of the alien civilization's total power output. Even a more modest transmitter would be a big project, comparable to those on Earth such as the Large Hadron Collider, or the whole of the NASA Apollo program. This scale was proposed by Russian astronomer Nicholai Kardashev as a way of measuring a civilization's technological level. There are three main types. Type I is one that utilises all the energy of its home planet. Currently, the human race doesn't even fall into this category, as we don't fully harness wind, tidal and solar power. It has been worked out that we are a "Type 0.7" and the estimation is that we could become Type I in another 100-200 years. Type II civilizations use all the energy from their planet's star, by constructing such things as a Dyson Sphere. Obviously, we humans have nowhere near the required technology to do anything like this, but it is estimated we could reach this level in a few thousand years. Type III are able to harness the total energy output of an entire galaxy. As well as targeting multiple stars with Dyson Spheres, they could tap into the supermassive black hole at the galactic centre, plus the huge energy potential of pulsars. Humans might reach this level in anything from 100,000 to one million years' time. I've interrupted the narrative to tell you about the Kardashev Scale to impress on you the amount of power that a continuous, strong radio signal would require. Even a Type II civilization, as tempting as it may be, wouldn't want to use up a large fraction of their energy on a speculative project like this. And so we come to the theories of a scientific family - James, Dominic and Gregory Benford - who have come up with the idea of the "frugal alien". They suggest that, rather than employ a continuous signal, the aliens would blast out very short, powerful signals, aimed at a sequence of different stars, which would recycle over and over again. This would conserve power dramatically. James Benford reasons that, as a continuous signal would be very easy to notice - and we haven't yet noticed any, the alien must be using the method he suggests. These intense, short bursts of energy have been christened "Benford Beacons". The only possible alien signal ever detected was the "Wow! Signal", which is dealt with in detail on this site here. If this signal was, in fact a Benford Beacon, that would explain why it's never been detected again. We just haven't been looking at the right moment - and at short enough time spans. Of course, being the humans that we are, we can't just sit back and wait for a contact with extraterrestrials to come to us; no, we've got to be pro-active and send our own messages out. Over the decades, both artefacts and messages have been dispensed into deep space, hoping they might be intercepted by other advanced alien species. In 1972, NASA launched the space probe Pioneer 10, followed, in 1973, by its sister Pioneer 11. 10's mission was to explore the Jovian system, while 11's remit was to do pretty much the same, but also take in a fly-by of Saturn. Thereafter, both craft would head off into interstellar space. Once they'd left the solar system, just in case they were intercepted by any intelligent alien races and at the suggestion of the late, great Carl Sagan, they were each fitted with a plaque fashioned from a mixture of gold and aluminium. It was a straightforward pictorial representation of Earth and its people. Some of the imagery is pretty obvious. You can see a man and a woman, set in front of an image of the Pioneer probe, to give a sense of scale. Across the bottom we have our Solar System, showing Pioneer to have originated from the third planet. The diagram middle left shows the position of our Sun in the Galaxy, using the frequency and direction of 14 known pulsars. A fifteenth line extends to the right, passing behind the human figures, to show Earth's position. The top left image is probably the most enigmatic. It depicts the hyperfine transition of hydrogen. Underneath the line joining the two circles, you can just about make out the binary digit "1". This is then used as a unit of measurement elsewhere on the plaque. The possibility of actual contact with extraterrestrials is unlikely. Pioneer 10's projected trajectory is taking it in the general direction of the red giant Aldebaran, which it should reach in two million years' time. 11 is headed towards the constellation Scutum. At just over 40 light years distant, it contains at least one star with planets. In 1977, NASA launched two more space probes, Voyagers 1 and 2, whose mission was to study whole of the outer Solar System, specifically the four gas giants and their ring systems and moons. Thereafter, they would also carry on and leave the Solar System altogether and head off into interstellar space. 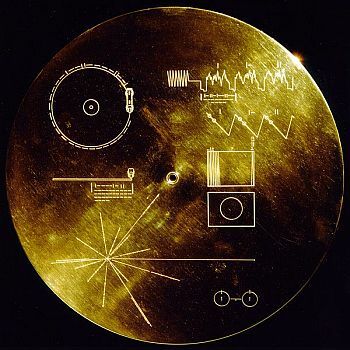 This time, in case of any extraterrestrial intervention, they carried on board a "golden record". Based on the principle of a vinyl record, from the days before compact discs, this was made from gold-plated copper. The cover (shown here) is aluminiun, onto which has been electroplated a very pure sample of the isotope uranium-238. This has a half-life of about 4.5 billion years, so any alien civilization discovering the record would be able to tell its age from the amount of decay of the isotope. The diagrams on the cover are mainly instructions on how to play the record. 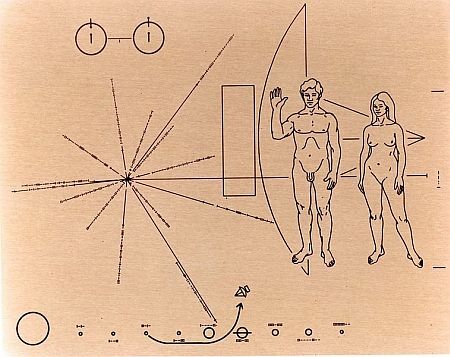 As you can see, the pulsar map and hydrogen depiction that appeared on the Pioneer plaque are also included. The record itself lasts an hour and contains sounds and images of Earth. The audio section includes the natural sounds of our planet, such as thunder, wind and surf, plus animal noises. A music section contains examples as diverse as Beethoven and Chuck Berry. There is a greeting uttered in 56 different languages, plus a message from the then US President, Jimmy Carter. The pictorial section has both scientific and cultural images, numbering 116 in all. Currently, the two Voyager probes are the most distant man-made objects, having overtaken the Pioneers. In about 40,000 years, Voyager One will be within 1.8 light years of the star Gliese 445, in the constellation Ophiuchus. Scientists do not think there are any Earth-like planets orbiting it. Voyager Two will eventually be on close approach to star Ross 248, in the constellation Andromeda. It is a red dwarf with no discernible planets. It's all very well attaching messages to space probes in the hope that someone (or something) may find them, but there have also been broadcast signals from Earth aimed at specific locations. 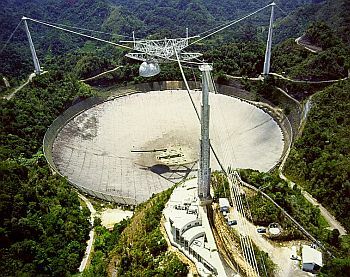 In 1974, the Arecibo Radio Telescope in Puerto Rico received a complete upgrade, increasing its observational power significantly. Avid film buffs will recognise it as the location for the climax of the James Bond movie, Goldeneye. It also featured in the movie Contact. To mark its upgrade, a single FM radio message was beamed into space, aimed at the globular star cluster M13. This was chosen simply because it just happened to be the biggest collection of stars in the sky at the time. As it's around 25,000 light years away, if anybody receives it and bothers to reply, we'll all be long gone. Anyway, it was composed chiefly by astronomer Frank Drake, he of Drake Equation fame, with a little help from Carl Sagan and delivered in binary format. Here's a decoded version of the message. It's been colour-coded to help identify the different sections. The top line, in white represents the numbers one to 10. Next down is a cluster of purple squares, representing the atomic numbers of hydrogen, carbon, nitrogen, oxygen and phosphorus, the elements that make up DNA. Next, the large cluster of green squares shows the chemical formulae of the compounds made by these elements. Finally, the white and blue represent the DNA double helix. Less scientific now, with an obvious human figure in red, flanked to the left by a depiction of the average height of a human and, to the right, the population of Earth, as it was then. The collection of yellow squares show our Solar System and finally, in purple, the Aricibo Telescope itself. This stands for "A Message From Earth" and is a 21st century attempt to make contact with extraterrestrials. These days, the existence of planets orbiting other stars has been proved and this message is targeting an Earth-like planet, Gliese 581c, orbiting the star Gliese 581, which is about 20 light years away. Broadcast in 2008 from the RT-70 Radar Telescope in Yevpatoria, Ukraine, it consisted of a total of 501 messages encoded in digital format. The messages were as the result of a competition run by the social networking site Bebo and was the first time members of the public had had the chance to contribute to anything like this. As of November, 2013, the signal was one-quarter of the way to its destination.